New Yorkers, take note: Trader Joe's FAQ (Frequently Accessed Quantities). Informative and entertaining. How to cook and eat an artichoke. Did you know that 100% of the U.S. crop is grown in California? La Cocina is a San Francisco-based non-profit community kitchen who's purpose is to assist micro-entrepreneurs become economically self-sufficient in part by providing them fully-licensed, affordable kitchen space. I first learned about La Cocina when I heard this NPR piece. Via Tablehopper, La Cocina is hosting an event for chefs, restauranteurs, and culinary retailers on Monday, March 6th. Get all the details here. Holy crap, look who New York's newest food blogger is: Frank Bruni! And there's a weekly podcast! And comments are enabled! Like, whoa. Shuna's write-up of the Common Wealth Club's Food Blogger panel (and the event itself) triggers quite an interesting reaction in the comments. Recipe for a food blogger flame war: 3 cups drama, 0 parts actual discussion of food, a pinch of bitterness (to taste), garnish with jealousy. Here's the thing: In every community, members have different expectations of community, different standards of behavior for themselves and others, and different goals for their participation. As I see it there isn't a singular food blogging community, and that's ok.
Love it or hate it, Valentine's Day is less than a week away. If you haven't made dinner reservations, you're probably too late and isn't that a little predictable anyway? Here are our Valentine's Day gift ideas that are likely to surprise and please your food-loving loved one. Good luck! 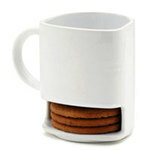 Keep your milk and cookies or tea and biscuits happily together with the Dunk Mug, cleverly designed with built-in cookie compartment. Available in right and left handed versions. Amai Tea & Bake House is back with a new and improved champagne brownie (improved? yes!). The brownies are made of Scharffen Berger 99% dark chocolate, Valrhona cocoa and real champagne. Only available for online until February 10th, so order now. In NYC? You can also find them at select stores. 86 Recipes is a cleverly designed collection of recipes from New York City restaurants, maintaining each chef's original intentions, with adaptations for the home kitchen. Use the cards to recreate your favorite restaurant meal at home, or discover a new-to-you restaurant. Mr. Bento Lunch Jar is the 21st century lunchbox. Mr. Bento comes with a series of microwaveable bowls that stack inside the washable container, which employs vacuum-insulated stainless-steel construction to preserve the temperature of its contents for hours.Need inspiration for your Mr. Bento? Check out the collection of photos from Mr. Bento fans on Flickr. Mobile cooking: how to cook an egg with 2 mobile phones, an egg cup, and a radio. Or, why you shouldn't talk on two mobile phones at once. UPDATE: OK, not really. "The radio waves from mobile phones are at least 100 times too weak to heat up an egg, they're at the wrong frequency to make water molecules vibrate, the antennas on mobile phones are directionless, and when you call one phone with another the (omnidirectional) signals are relayed via radio towers rather than directly." Thanks, Harlan! I <3 the Internet. For my vegan friends, another tasty vegan blog, Eat Air - A Vegan Food Log.